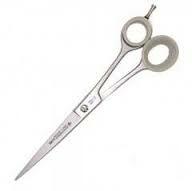 Your dog grooming scissors are taken completely apart and fully serviced. To service delicate dog grooming scissors correctly takes time, effort and skill along with the correct tools and machinery. Repair any damage to the cutting edges. Sharpened using specialist dedicated machinery for each operation. Re-serrated if required at no extra charge. Re-establish the ride line using an 6000 grit Japanese water stone. Put back together checking all parts for any damage. Check and adjust the balance. Test cut to make sure they slice right to the tip perfectly without pulling. If required we will replace bumpers / stoppers, metal finger rests, pivot screws, washers, spring plates and ring inserts, and they are all included in the price of a service, so no extra to pay.